The Appropriations Committee Room, where legislators have been deciding state budgets for over 100 years. This week the legislature was in recess, but that doesn’t mean we weren’t working! 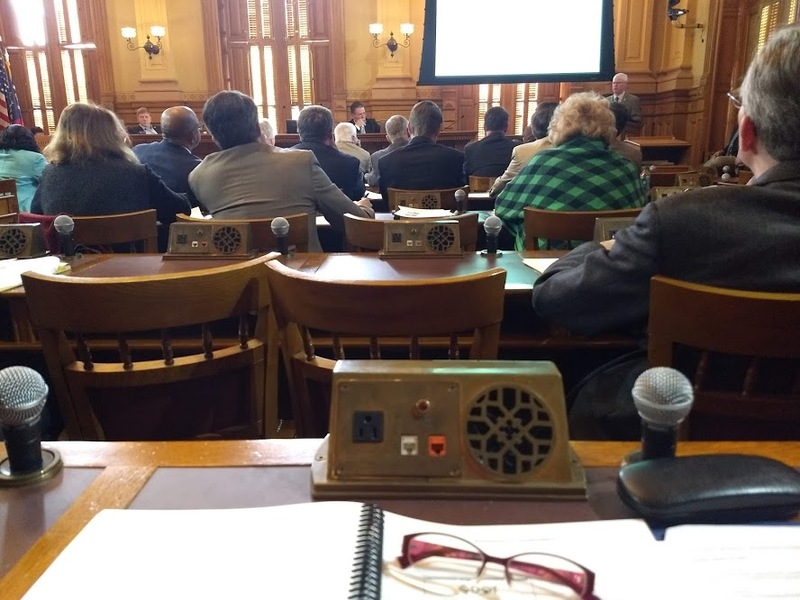 Georgia’s Constitution limits the length of the legislative session to 40 days, which isn’t really long enough, so we take “breaks” to concentrate on committee work. Even though I’ve been working for two weeks, we’ve only used four Legislative Days! The legislature uses the week of the MLK holiday to present an overview of the Governor’s proposed budget. This week I attended these budget hearings. During my previous service in the House of Representatives, I served on the Appropriations Committee, so I know the huge impact the budget has on the priorities and values of our State. The budget hearings are an opportunity for Heads of Departments to showcase their accomplishments and briefly outline their priorities. 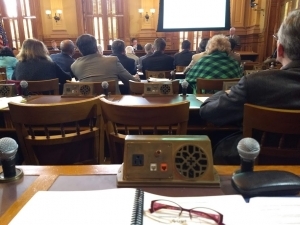 As with any committee, the hard work of moving money around to redefine priorities happens in Committees throughout the session, and this process has only just begun. Joining with my House colleagues to provide a legislative update to the Roswell group Needles in a Haystack. Don’t we look more like the haystack now than the needle? This week I met with constituents around the district. I did a lot of this during the campaign, but now, as a Senator, I represent everyone. It’s important to make sure all voices are heard. Here’s a “snapshot” of who I have been meeting with and what I took away. The Waiting List for Disabilities Services: Families are struggling with the Medicaid waiver process to access critical services for their adults and children with developmental disabilities. Advocating for people with disabilities has always been a priority of mine. Georgia is 45th in the nation in funding to support people with disabilities, so there’s a lot of work to be done. I have already visited with numerous parents who have children with disabilities. Medicaid Waivers allow for in-home support, but for decades there have been long waiting lists (now called “Planning Lists”). At the budget hearings, the Department of Community Health acknowledged that applying for services should be easier for families, and listed as one of their priorities “Continuous Process Improvement.” What I am hearing from parents is that applications are extremely cumbersome, so I will work with the Department to help them achieve this goal. Visiting with constituents who were writing postcards advocating for redistricting reform. 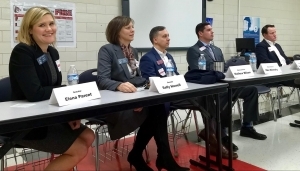 K-12 Education in Georgia: Finally, I spent time with several local school councils. It is clear to me that our schools are suffering from budget cuts – billions of dollars of lost revenue over the last decade. School overcrowding, stagnant teacher and support staff pay, and lost revenue from private school vouchers, tax abatements and annexations are all creating pressures to serve more students with less money. Georgia has failed year after year to update its school funding formula, and until we do that and begin to pay back over a decade of under-funding, we cannot responsibly say we have “fully funded” our public schools. I began the week honoring MLK Day with members of the historic Lynwood Park community in Brookhaven. Lynwood Park is a historically African-American community that has undergone dramatic changes in recent years due to gentrification and changing demographics in the area. I was so moved by the wonderful memories current and former residents shared and their deep connection to Lynwood despite these changes. It reminded me that economic progress can be a double-edged sword for communities like Lynwood that stand to lose a part of themselves as neighborhoods grow and evolve. Addressing income inequality and supporting policies that promote housing affordability remain a top priority. 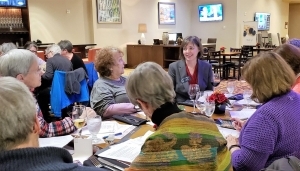 — As we continue to get my Senate office up and running, we’ve realized how much work it is to cover a district that’s three times larger than the House District I represented. I’ve heard from several supporters that they’d like to help, so this week we identified a couple of new volunteer roles, including helping us keep up with local news and events in your area (more details and sign up here) and serving as a volunteer photographer (details and sign up here). We’d love to have you join the team. — The Senate page program is a terrific one-day opportunity to help kids, ages 12 to 17, experience our state legislature first-hand. To learn more, visit the Senate page program web page and if interested, follow the instructions for how to apply. Send the application to my assistant, Anna Boggs at Anna.Boggs@senate.ga.gov, and she’ll get it to the Senate page office. They will take it from there. Next week, we are back in session Monday through Wednesday and then off again for the Super Bowl weekend to help alleviate traffic downtown.